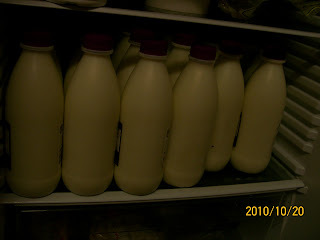 Collected milk yesterday afternoon, just over 20 litres which will last the week. Not just for us, the dogs and cats love the stuff, even the chooks want some. Not any ordinary milk but straight from the cow, unpasteurised and still warm. There are a couple of friendly dairy farmers close by who are happy to part company with some of their production in exchange for some “cash money”. William Campbell Douglass MD writes in The Milk of Human Kindness Is Not Pasteurized about the negative aspects of pasteurisation. There are other studies, in particular Francis M. Pottenger, Jr. Again refer to an article in Wikipedia called Pottenger’s Cats. In summary, cats on raw milk as opposed to pasteurised were healthier. Our raw milk has a shelf life of 7-10 days. The important factors are making sure the containers in which it is stored are thoroughly cleaned each time and also that the milk is refrigerated quickly to 4 degrees Celsius or lower ie put in a normal refrigerator. 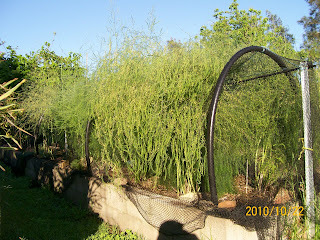 An interesting thing is going on with our Asparagus. The 2 year old plants (Connovers Colossal and Argenteuil) came up as expected during the last week of August and the first week of September. These we won’t harvest for at least another year. The four year old Mary Washington’s did nothing until early October. Most unusual and unexplained. Our favourite way of eating Asparagus is to lightly steam them and serve whole spears sprinkled with Parmesan, chopped hard boiled egg and a good splash of dressing. The dressing is made from Apple Cider Vinegar, Extra Virgin Olive Oil, some Miso a dash of Shoyu and some Balsamic Vinegar . What we call the Tomato Bed is all planted out. It’s a bed a metre wide and about 30 metres long made from a layer of composted cow manure, a layer of litter from the chook yard and a layer of mulch hay. It’s that long because we can’t ever seem to reduce the number of varieties we like to try. This year there are 15 varieties and 25 seedlings interplanted with some Basil. 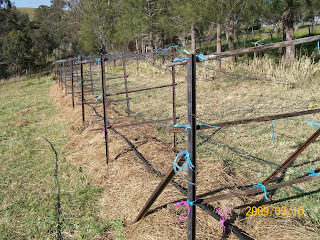 These don’t take up all the 30 metres and so there are some capsicum and eggplant at one end. No staking involved. 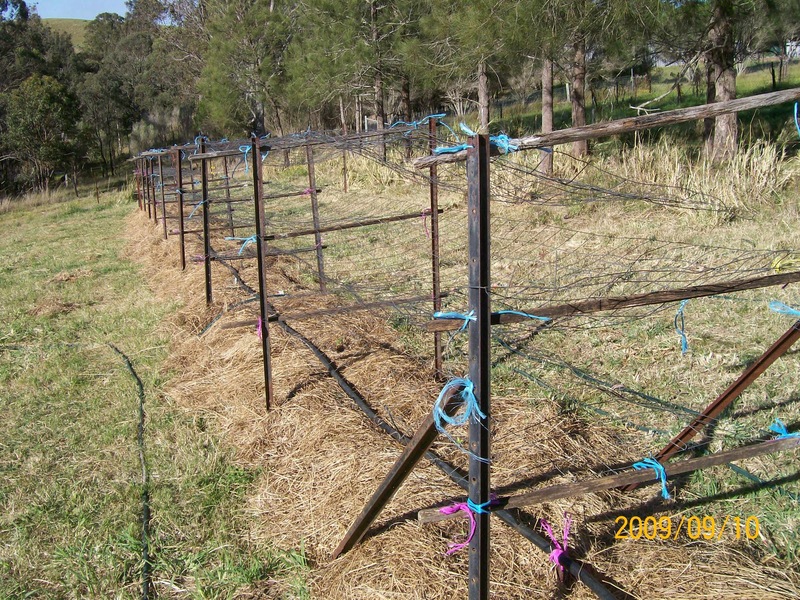 Instead, three layers of mesh at 400 mm spacing (roughly) are supported by steel posts every 2.5 metres. 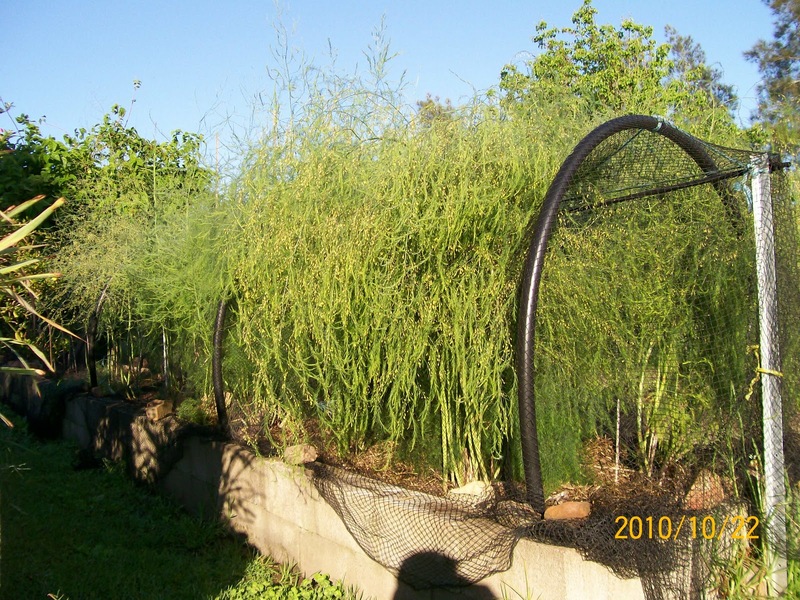 The plants grow up through the mesh and don’t need staking, just tuck in any outside branches during the growing season. The ease of maintenance appeals to our lack of discipline. We preserve very few fruits and vegetables. Eating fresh is important and so we have a pick and eat policy. However, Tomatoes provide great flavour to Pasta sauces, stews and all types of other dishes. 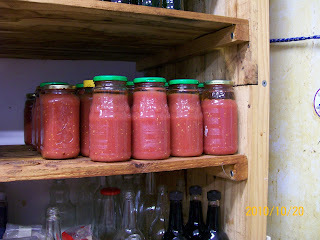 When we have had our fill of fresh tomatoes, the bottling starts. Tomatoes through a blender, then into a big pot, raised to a rolling boil for few minutes and into steel capped glass jars. About 50-70 keep us supplied for the rest of the year with a few left over in case of a disaster in the tomato bed the next year. 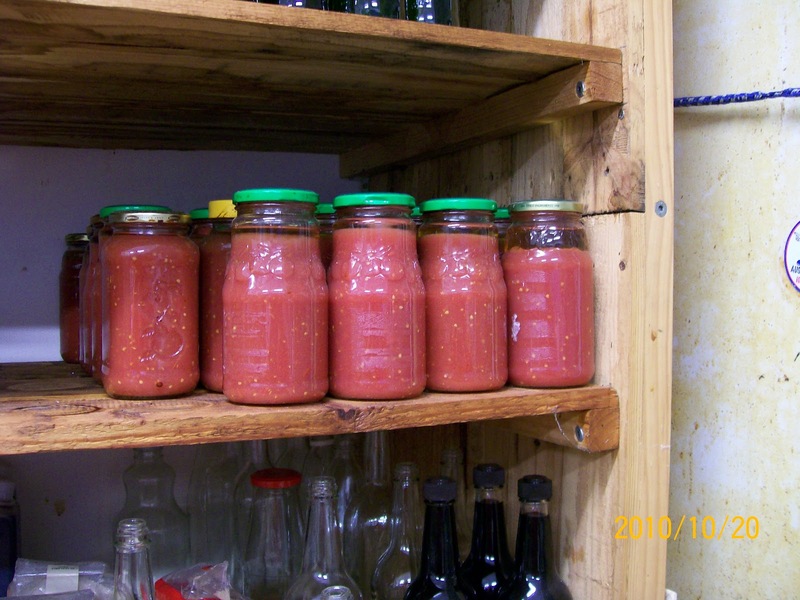 Jars are easily acquired from friends who prefer pre-packaged pasta sauces. This tomato puree keeps for years. Leave in the seeds and skins. It is crazy to remove these when they contain so many of the vitamins and minerals. The sauces may look a little better without the skin and seed but not as healthy. If we want a more intense tomato sauce we mix some dried tomatoes with the tomato puree in a blender before cooking. This gives a thick very rich tomato flavour. The tomatoes are dried in a Nara drier which has five trays. Thick slices of tomato sprinkled with salt to help preserve. You need to experiment a bit until you get a feel for the quantity of salt. If they are too salty they can be soaked in hot water before use. Dry them quite dry and place in a jar covering with extra virgin olive oil. Don’t fill all five trays to start. Start with 2-3 trays of freshly cut tomatoes then when they are partially done add the remaining trays. This eliminates the possibly of any mould forming because of the humidity. 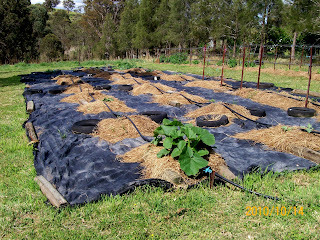 The Tomato bed is not just the tomatoes it also includes a large weed matted area planted to melons, pumpkin, cucumber, zucchini, beans, and okra. The bed is out in a paddock and we move it every year. That’s right, dismantle and erect. It takes about 3 days in total and then for the next 8-9 months it provides food. The by products are the increased fertility and grass cover of the once barren hilltop. Over the last 17 years we have worked from one end of the ridge to the other and last year returned to the beginning. Another form of rotational planting. We have settled on two types of climbing beans. One is called a Rattlesnake. Its attraction is the quality in taste, no matter how mature it becomes. It is prolific and has an extended growing season. The other is the Chinese Snake Bean. You know those thin 300-400 mm long things. Best picked early when crunchy. A different but pleasant taste, prolific and again a long growing season. Should also mention the Japanese climbing cucumber. Will climb easily up a space saving trellis, can be eaten small or large. Can grow quite large fruit which is still tasty and has a long growing season. Cabbage can be a useful vegetable. We’ve found two recipes. Recipe 1 Sauerkraut: using a Russian mother’s old recipe. Slice into ribbons, finely chop some carrot, add some dill or caraway seeds then spent a few minutes scrunching this so that is all nicely bruised. Stuff it very firmly into a huge glass container or enamelled pot and weigh down so that the liquid covers the pulp. This will ferment over the next week and can then be sealed and stored in the refrigerator indefinitely. And by the way the Carrot and seeds can be left out. Recipe 2 Asian Cabbage: cut into ribbons enough cabbage for immediate use. Place in a saucepan with plenty of extra virgin olive oil (or butter), add chopped dry chilli to taste with a liberal sprinkle of Fish Sauce. Simmer till tender and serve with whatever else you are having. Make sure the Fish Sauce is real ie salt and fish only not one of the fake ones with added this and that. Just a note on Extra Virgin Olive Oil. There a lots of good Australian oils available at very good prices; we use it in all our cooking. Aldi have one of the best which has been tested for quality and definitely price. Cold pressed and less than 1% acidity. Some of the imports have tested with higher acidity and some have also been adulterated with other oils. Stay clear of Pomace oil unless you are using it for making soap or lubrication. It is chemically extracted and not a healthy product. Spring has arrived and with it the self defence plans are implemented. The Tropical Peach and Nectarine trees have flowered and the small green fruit appeared. On go the fruit fly and parrot protection bags. 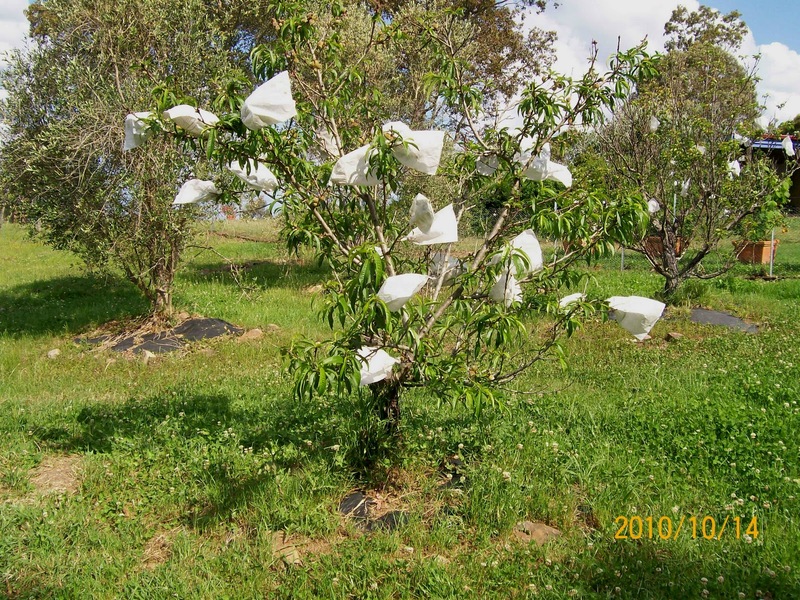 For these early ripening fruits, paper bags (ex Green Harvest) are placed over the fruit. Usually with small fruit we’ll do 30-40 bags as that is about as much as can be eaten during the season. The Apricots, early Plum and non tropical Nectarine are next and the traditional Peach. The Tropical Apple is a longer ripening fruit and has huge bunches which require large cloth bags. By the time the Tropical Apple is ready to harvest the parrots are desperate and will shred paper bags. With larger fruit such as apples and pears, 20 bags are sufficient, unless it’s for Cider or Perry then it’s an all out effort. This can be a tedious task, however securing a supply of fruit is vital. But with earphones attached listening to local radio passes the time pleasantly. 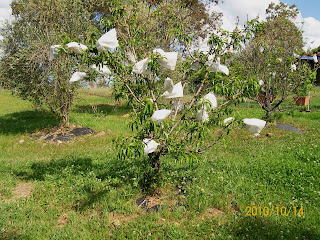 We find netting helped with the birds but was very damaging to trees when removal was required and didn’t help with fruit fly. We have tried various organic pots and potions against fruit fly but at best only a small percentage of the flies are caught. The only 100% solutions are bagging and chemical sprays. Chemical sprays are not acceptable to us. Mulberries are on at the moment. The sweetest fruit is that which falls into your hand when touched. It is impossible to keep for any length of time. We pick a couple of hours before eating at the earliest or just forage from the tree.